Eating a low-fat diet, getting regular exercise and watching your weight can help lower risk for heart disease and stroke. But environmental and cultural factors also make a difference. So can how much you make for a living, especially if it barely brings in enough to pay for housing, groceries or the electricity bill. Social determinants of health are factors that influence where and how people live, learn, work and play. They provide context to a person's life and can play just as big of a role in affecting health as medications and physical lifestyle changes. The new prevention guidelines developed by the American Heart Association and American College of Cardiology recognize that "socioeconomic inequalities are strong determinants" of cardiovascular risk. Healthcare providers need to address social determinants when working with patients just as much as they might address a smoking habit or strategies to lower blood pressure or cholesterol, said Dr. Michelle Albert, a member of the guideline writing committee. "Social determinants must be part of the cardiovascular prevention conversation with patients. Doctors know these things are important but typically, they've just focused on traditional risk factors," she said. In a pie chart of cardiovascular disease, "only about 20 percent of cardiovascular risk is genetics. The other 80 percent is either behavioral or environmental," said Albert, a professor of medicine at the University of California at San Francisco and director of the Center for the Study of Adversity and Cardiovascular Disease. "What we've done with our previous guidelines is focused on behaviors that are traditional risk factors when, in fact, social determinants are driving the show, especially for those communities where socioeconomic adversity and thus gaps in cardiovascular mortality persist," she said. Social determinants of health influence a person's cardiovascular health factors and behaviors. For example, a person's neighborhood and how safe it feels can have an impact on the ability to both exercise and eat healthy, said Dr. Tiffany Powell-Wiley, chief of the Social Determinants of Obesity and Cardiovascular Risk Laboratory at National Heart, Lung, and Blood Institute. People who feel unsafe where they live may be more likely to stay home, resulting in less physical activity, she said. "The feeling of being unsafe may cause you more stress and increase stress-related hormones," she said. "Those stress hormones may then promote weight gain. There's definite data to support a relationship between that feeling of safety and health markers like weight … and even blood pressure." Allowing patients to put context to their lives can be the key to having them follow a healthcare provider's advice, Powell-Wiley said. "If you live in a community where there are no sidewalks and there are no opportunities to be physically active, a physician telling you to exercise more may go in one ear and out the other," she said. "Or if you are told you need to eat a better diet, but you don't have any access to healthy foods in your community because the closest store is a convenience store or a gas station, the concept of eating healthy may not exist for you." The new guidelines suggest ways for healthcare providers to embed social determinants into conversations about various risk factors. For example, when talking about diet modifications, "body size perception, as well as social and cultural influences, should be assessed," the guidelines say. That's because some patients considered overweight on paper may think "their body looks perfectly fine" because of cultural beliefs and ideals, Albert said. "Addressing social determinants can give you a bigger bang for your buck, likely, than using a pill." 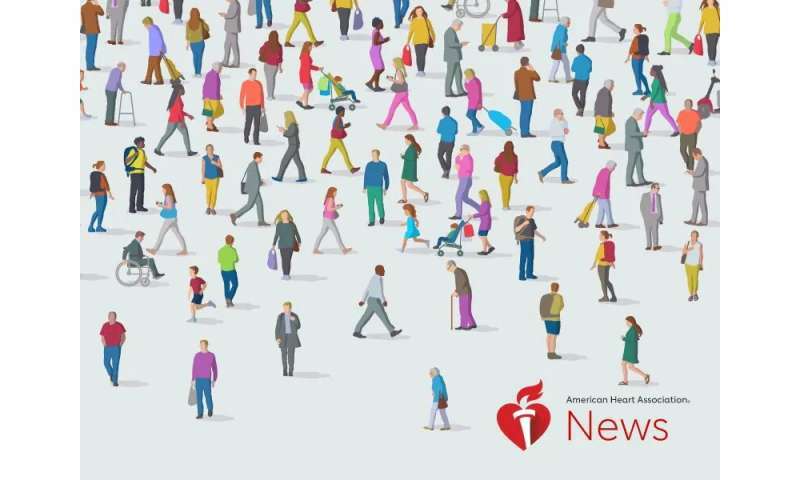 Can social connection aid heart health in African-American community?